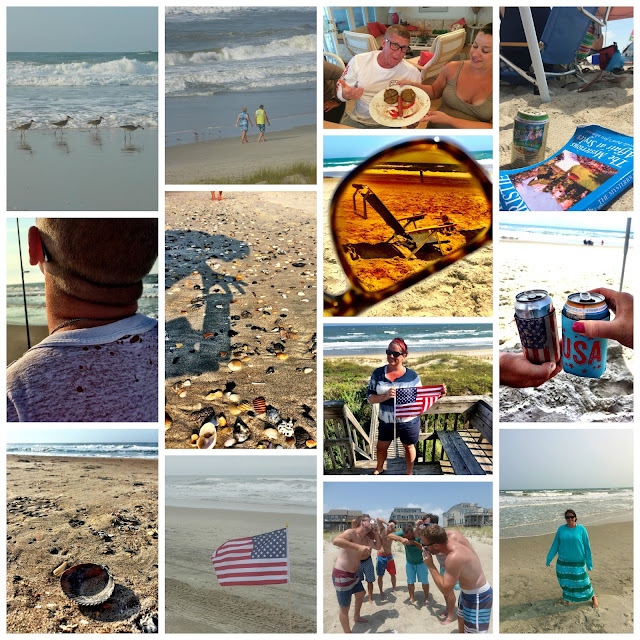 We spent last week nine hours down the coast in Emerald Isle, North Carolina. 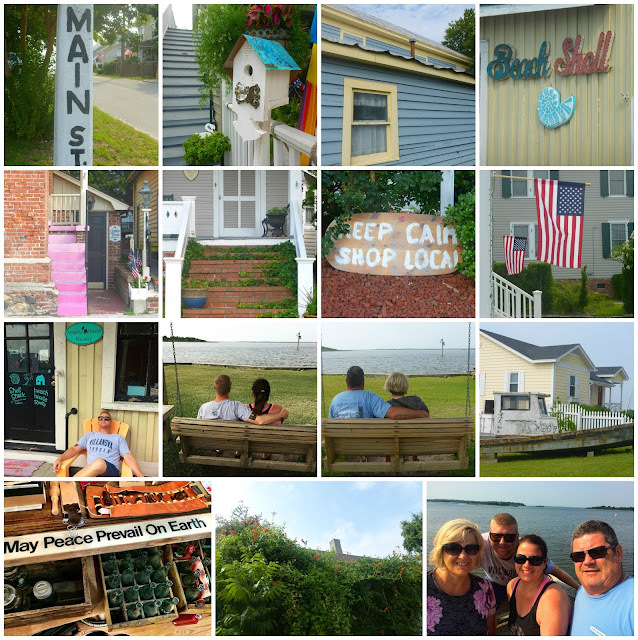 A quiet, pretty little beach town, the perfect place in which to relax. Picture heavy post ahead (apologies for duplicates from FB or Instagram), starting with my favorite thing about vacationing on the beach: the opportunity to see the sun rise and the light play off of the water. I got up at 5:30 every day except one to see it. I got dressed quickly, grabbed some iced coffee and a chair, and crept down to the beach as the light crept up. I also like the sunsets and Magic Hour in particular, but they were only good Sunday and Tuesday. There were some spectacular moonrises as well. There's nothing like staying beach front, something which is much more affordable down south rather than in Jersey. We had some sweet flyovers too due to the proximity of Camp Lejeune. 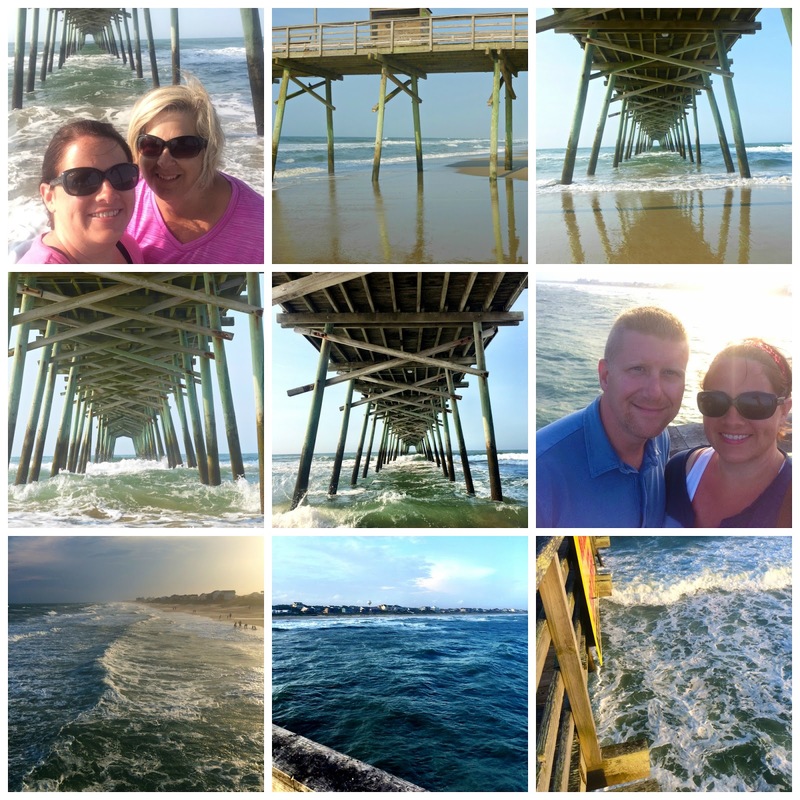 Emerald Isle has a cool pier, the Bogue Inlet pier. Carol and I walked down one morning and MFD and I went out on top of the pier Thursday night. It was swaying in the wind then and I beat feet off of that pier so fast. Panic at the disco. MFD and I joined my Dad & Carol on a tourist shopping excursion that included lunch at a roadside dive that was awesome. We also checked out Swansboro one morning. I liked the cute little towns that were a quick drive off of the island. You can't talk about vacation without talking about food. Monday - seafood feast (crab legs, steamers, scallops prepared two ways, shrimp prepared three ways); Tuesday - taco Tuesday, guacamole, salsa and cheese with chips; Wednesday - pulled pork, sauteed green beans, roasted potatoes, cole slaw; Thursday - MFD and I went out to Kathryn's and split a soft shell crab. I had a great ribeye. Vacation cereal, I rarely eat it at home. Us northerners bring scrapple with us on vacation. An awesome berry tart in Swansboro. Reese's s'mores dessert. Fabulous ice cream from the Sweet Spot. If you're ever in the area, go to Big Oak in Salter Path and get the shrimp burger and fried pickles! Our friend Julie recommended it and it was awesome. But of course the main attraction was the beach - and the company. It was great to spend the week with my family with Stephen's friends from college in town as well. We did a lot of swimming, no sharks in sight. Top two pics are MFD catching a wave and my Dad. Thanks to Carol for the bottom two pics of me on my float with Stephen assisting to keep me from being carried away. I did a lot of reading (thanks to Carol for the standing pic), finishing 6.5 books and starting a seventh on the way home. 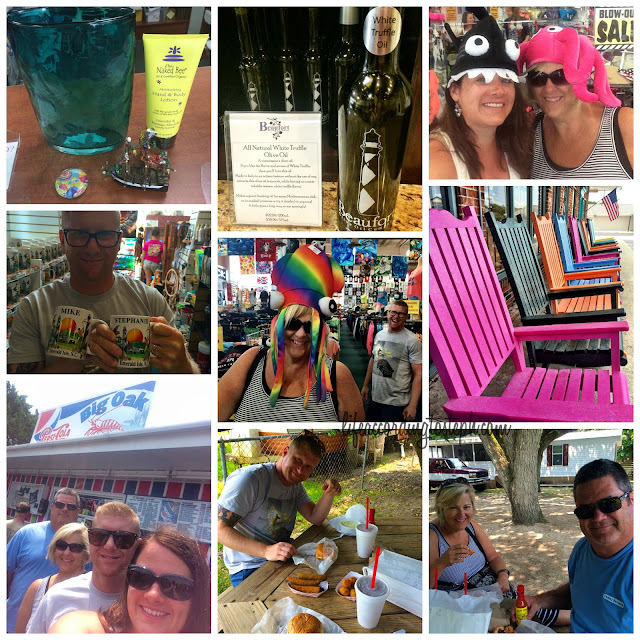 And of course we did a lot of relaxing and picture taking and laughing and talking. I love the restorative and rejuvenating powers of being next to the sea. It's been five years since MFD and I spent a week at the beach mostly in relax mode. I mean, I was in total relax mode. I forgot how awesome it is to do that. If I was any more relaxed, I would be dead. MFD was in work mode except for the times I forced him to be in relax mode...I appreciate that his business is demanding but I will always push relaxation on him. We all need it, am I right? 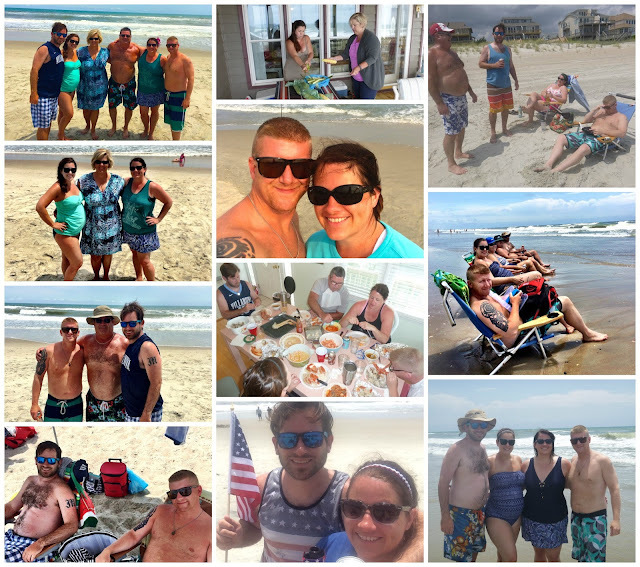 We loved it so much we already decided to go back to Emerald Isle with my family in 2017. See you then, sleepy seaside town. Your pictures are absolutely stunning. Especially those sunsets. Those colors. Wow. Your food spread is absolutely mouthwatering. It's 11pm here and you just made me drool. Looks like you had tons of fun. I've never been to North Carolina and now I think I need to. Those sunsets are beautiful, and I too love a good moon rise. I believe sea air is restorative. I wonder what it is about the sea that's so deeply relaxing? Sounds like you made the right decision to go back! i'm so glad you guys had a great time! sleepy beach towns are the best. Best vacation to me would be a close, affordable beach front where I could take my pups and my people. Sunrise is nice but so darn early. I love watching the moon rise out of the ocean. What a dream it would be to live there! Looks like the perfect vacation from start to finish. The sights, the food, the company. You had it all!! So glad you had a great time and weather and planned for your return. 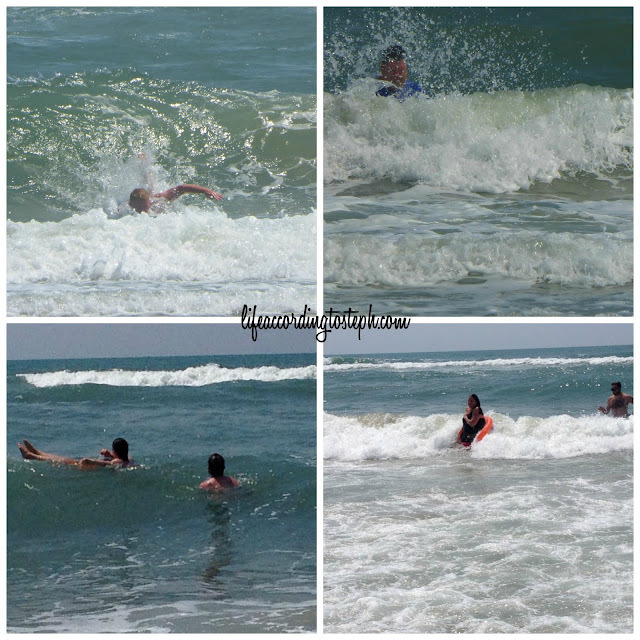 these pics made this beach-loving girl so, so happy!! those sunrises are everything!! i grew up being beach-front, so i was spoiled and want it everytime i stay any where. Emerald Isle is beautiful! Glad you had a great time. Fab pics! Thanks for sharing. There really are some beautiful places in the U.S. I would definitely consider visiting just having seen your pics. this looks amazing. love all the pictures, the standing reading one is the best ;) the last time i took a relaxing vacation like this.. was when i was a kid, so it wasn't even very relaxing. i do like to go-go-go on holidays right now, especially because i only have 2 weeks vacation.. if i had one extra week i would love to do a relaxing week at the beach. i have a feeling in a few years we will be more relaxing beach people than jetsetting all around the world, but who knows. I don't understand scrapple and only learned what it was when my FIL moved to DE. Is it really that big of a thing? I mean he eats it but he also eats anchovies and egg foo yung and other things not commonly seen on menus. Now I'm intrigued. Love your sunrise dedication, the small towns, and the idea of relaxing for a week! wow! This is beautiful and the pictures are am amazing. Next time will you stick me in your suitcase? I was going to ask you about the sharks! Did you guys rent a house or were you at a hotel? Not sure if I missed that somewhere. Your pictures are beautiful! I'm so jealous that you got to read all of those books while you were away. 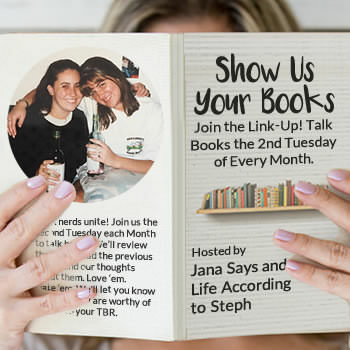 I had one sitting in my Kindle library and I barely got to pick it up. Glad you guys had a great vacation! Why does blogger eat my comments!?! It surprises me still how many military aircraft we see, we aren't really that close to a base but we have at least one fly by of some kind a day. Now that the holiday is over I need to get back to sunrise dog walks, I actually miss sunrise! Looks like vacation was super fun! Love all the pictures. That vacation looks & sounds perfect! Sunrises/sunsets are one of my favorite things. As always all the food you had looks mouth watering good. You had me at seafood & guac. ahhhhhh, I'm relaxed just looking at this! I LOVE weeks like this and the beach is forever the most magical place in all the land. The atmosphere is too profound for words. 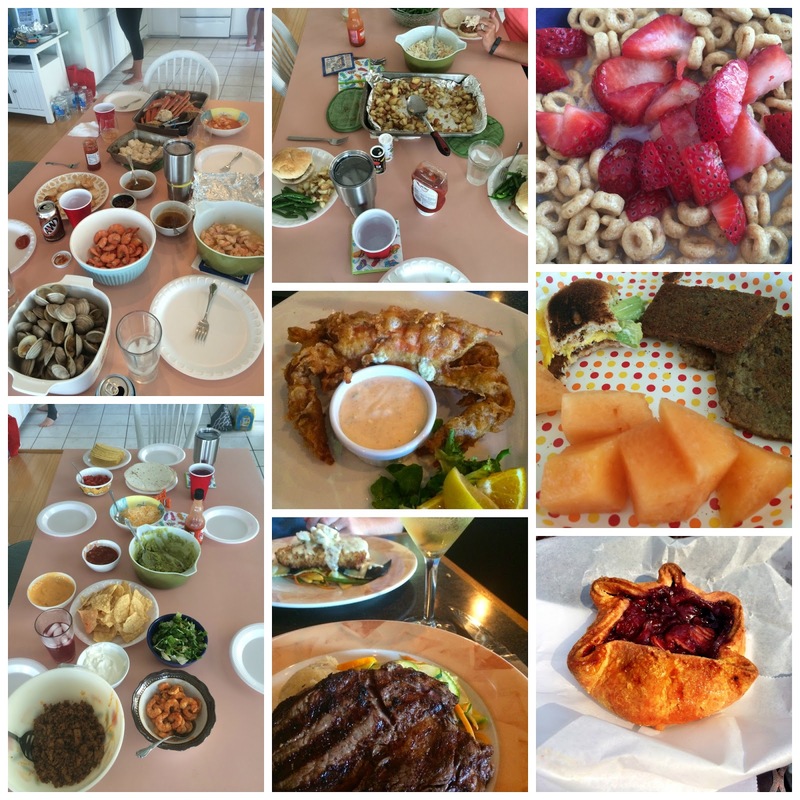 I love the food shots (yes, food on vacation = incredibly important! ), the photo of your dad catching a wave LOL and the panic at the disco comment, hahah. Also, I can't believe you stand and read! I'm so lazy, I would never think to do that, ha. But really- fun post to look at. I want a week at the beach! Been forever since I did that. Your beach trip looks amazing!!!! You got so many great pictures of the sunrise! And the food! All the food! Mmmm!!! 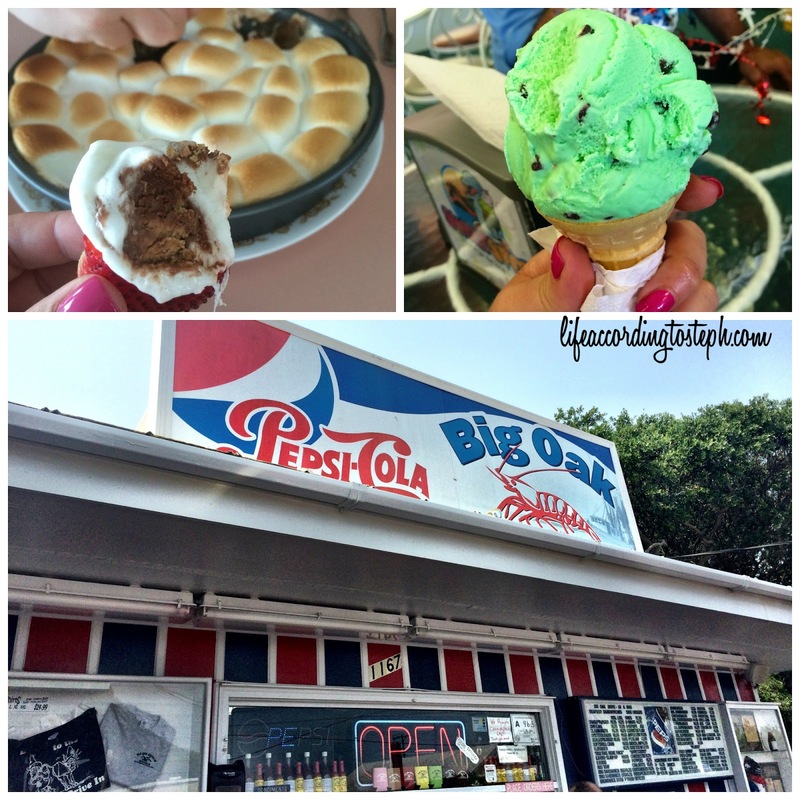 One of my favorite parts of vacationing is the food, for sure! A few days of relaxation at the beach is great for the soul. Glad you got to enjoy it! This town looks fantastic! All the beach, family, food, fun!! Fantastic! "If I was any more relaxed, I would be dead." Love it! Looks like such a fun week, and I'm really glad y'all didn't see any sharks. 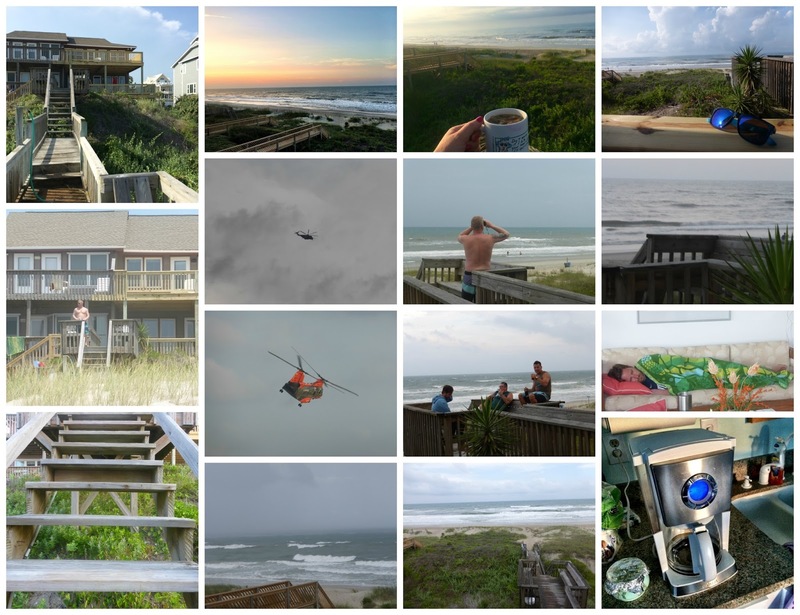 These pictures are exactly why I'm pushing to go back to North Carolina or South Carolina for our vacation next year. We went in 2009 and it was amazing. The roadside dive food is some of the best I've ever had and it was more relaxing than any other vacation I've had save for our honeymoon. man, your pictures are the best! I want to hang out under it. It's always good to go somewhere are ERALLY relax. sounds like you got to do just that! Beach towns are the best, not that I'm biased or anything! Your vacation looks great. I need to take better advantage of living here than I do. I take it for granted. If only I didn't have to work!!! I have been swooning over your sunrise pictures all week!! Seriously- there is nothing better than just sitting next to the ocean and listening to the waves. *sigh* I really need another beach vacation! LOVE, LOVE your pictures!! You were killing it with those sunrise/sunset! I'm missing our lazy beach vacation so bad now :( I love scrapple! They sell it in NC grocery store's too, Neese's brand. The best I ever had though was at a restaurant in VA. I want a seafood feast...YUM! The bottom left sunrise pic is my favorite. Also, the sunglasses pic and the side by sides on the bench- so cute! I love local dive places- they always have the best food! I can't believe you guys brought scrapple with you- I've actually never had it! Did you collect any seashells? I like to keep a bigger one (when I can) and write the date/location on it. Looks like a wonderful family vacation! 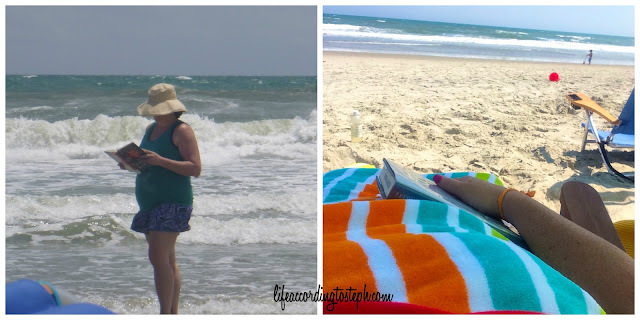 I can't wait for the day I can spend a week at the beach just to relax with 6 books in tow!!! I read three over the 3-day weekend in my bed though. That was pretty relaxing. I love your sunset pictures! Sounds like an awesome time. Glad you had fun! I have not been on an overnight beach trip in years; I want to do that soon. Love everything about this! So glad you had a wonderful trip. 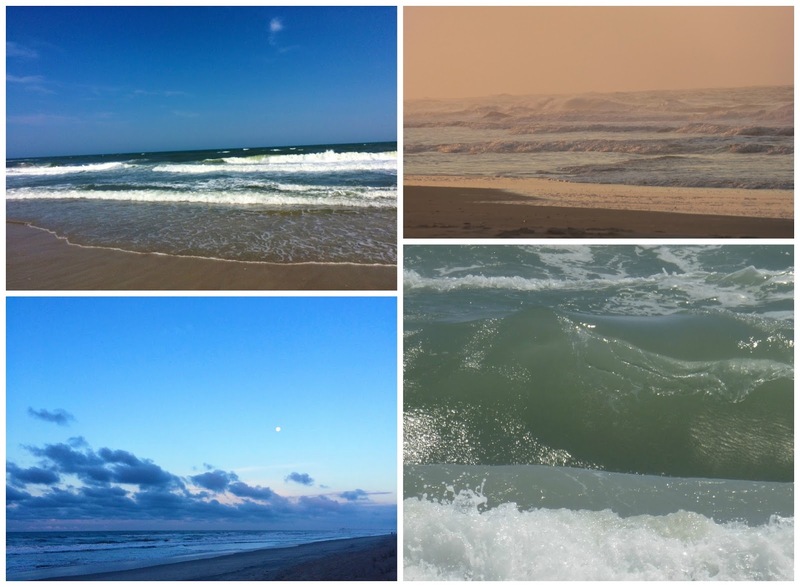 I love these pictures (especially all of the gorgeous beach shots)! I've never gotten up just to watch the sun rise. I've stayed up until the sun rose plenty of times, but I'm not a morning person at ALL. 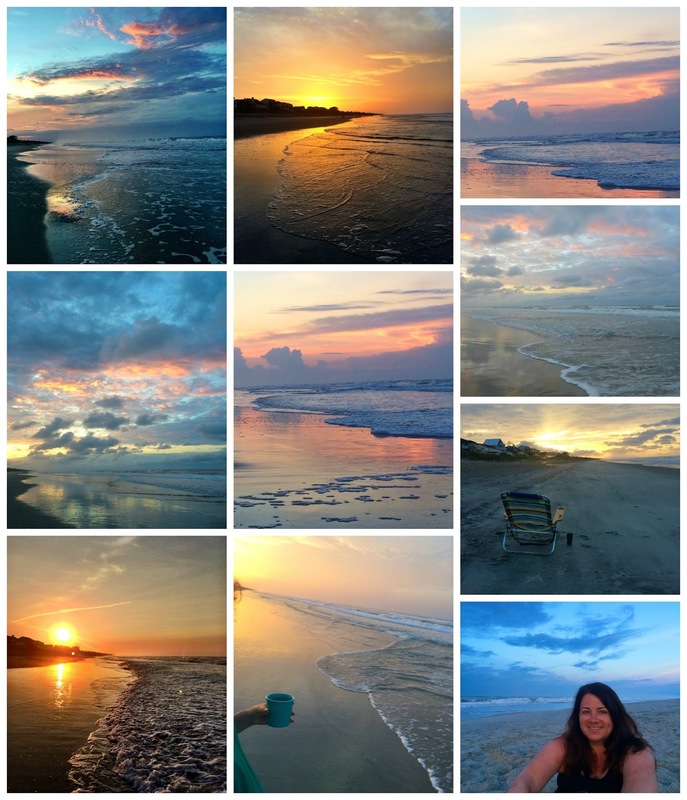 The collage of sunrise pictures is heavenly. I'm not a morning person. You've just slapped me silly with the realization that I've missed many opportunities to see exquisite sunrises. I need to add this to my life. 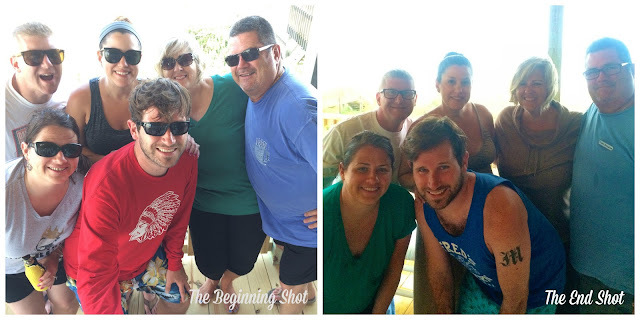 My family (mom, brother, sister-in-law, nieces, nephew, aunts, cousins, uncles, etc) went to Seaside, Florida about 5 years in a row. I joined for one. I think it's awesome that you found a slice of heaven for you and your family to gather and relax. Looks, sounds, tastes amazing! Very cool you've already decided to go back in 2 years. Wow, finished 6.5 books! And yay for relax mode. You're a good wife to remind the husband to relax as well. Gorgeous pics! Hooray for no sharks! Oh, how I love relax mode. Those sunrises, though...*heart eyes* so my favorite thing about the East coast! The reading standing up pic is fabulous. All of that food looks absolutely delicious, I can't wait to visit North Carolina, it's on my list!! 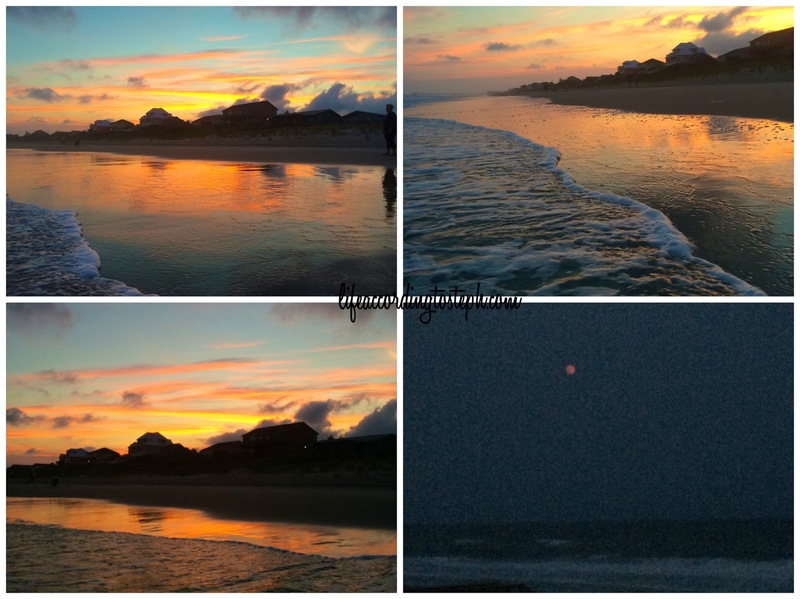 Your sunrise and sunset pictures are to die for... I can't remember my last beach vacation that didn't involve fog off the Northern California coast, but I resolve to start getting up earlier and appreciating those sunrises and sunsets on my next beach adventure!!! I love the bright painted rockers - I think I would have wanted to bring one home!! All your sweet treats are making me crave ice cream!! What a fun vacation. The sounds of the ocean are the best especially waking up to sunrises. The food looks amazing too.